For nearly a century, archeologists have routinely used aerial photo-graphs as a key tool for discoveries and investigations. In western Europe, the discovery through aerial reconnaissance oftens of thousands of previously unknown sites has transformed the way the past is interpreted and explained. In discussions of archeology, aerial views are often far more informative than ground photographs because the aerial views show the whole site within its geographical and environmental context, and they often show patterns too subtle or confusing to be recognizable on the ground. 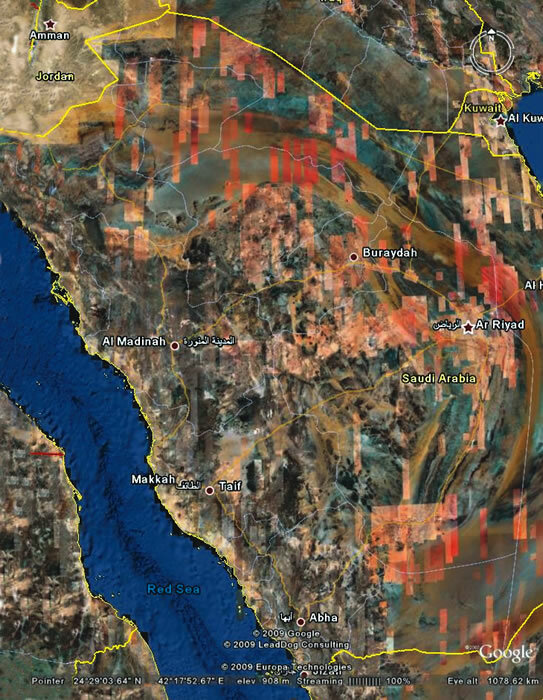 Above: Amid the patchwork of Google Earth’s satellite imagery, 15 to 20 percent of the Arabian Peninsula is covered at resolutions high enough to show archeological structures. 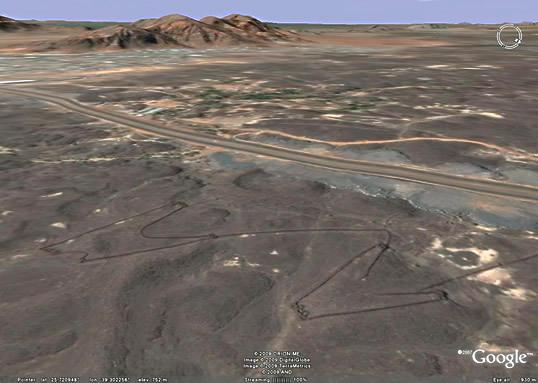 Below: Google Earth’s ability to tilt the viewing angle provides oblique views like those from an aircraft. 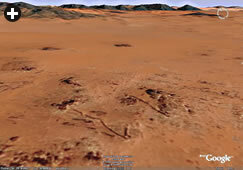 The dark lines are the remains of stone walls barely visible on the ground (bottom). Animals may have been driven into this “barbed arrow” structure; the rounded “hides” at the points may have given cover to hunters. In the Middle East as a whole, there is a growing awareness of the value of this technique, particularly given the volume and complexity of remains and the need to balance preservation with rapid industrial development. 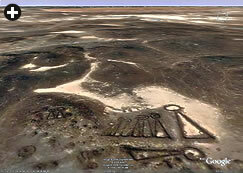 Jordan has instituted and supports a program of aerial archeology, to which I have contributed. 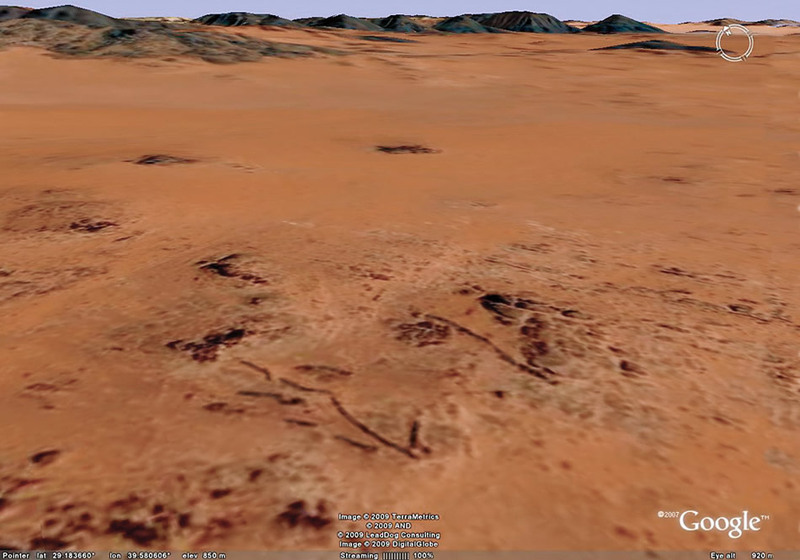 Recently, however, archeologists have begun to use the satellite imagery publicly available since the launch in 2005 of Google Earth, particularly since its gradual incorporation, beginning in 2007, of high-resolution images. As a result, over some Arab countries—Jordan, Syria and Lebanon particularly—the resolution of available images is now generally high enough to conduct reliable, general archeological surveys. Thanks also to the strong archive of historical aerial photographs from these regions, many dating from World War i to 1948, the new information can often be compared to the more distant past. Elsewhere, from North Africa to the Arabian Peninsula, Iran and Central Asia, there have been no traditions of aerial archeology, and the satellite photomaps on Google Earth remain an uneven patchwork of large areas insufficiently detailed for archeological searches. 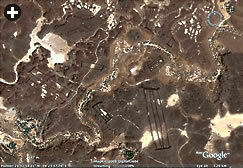 There are, however, smaller but growing numbers of “windows” of high-quality imagery among the patches. 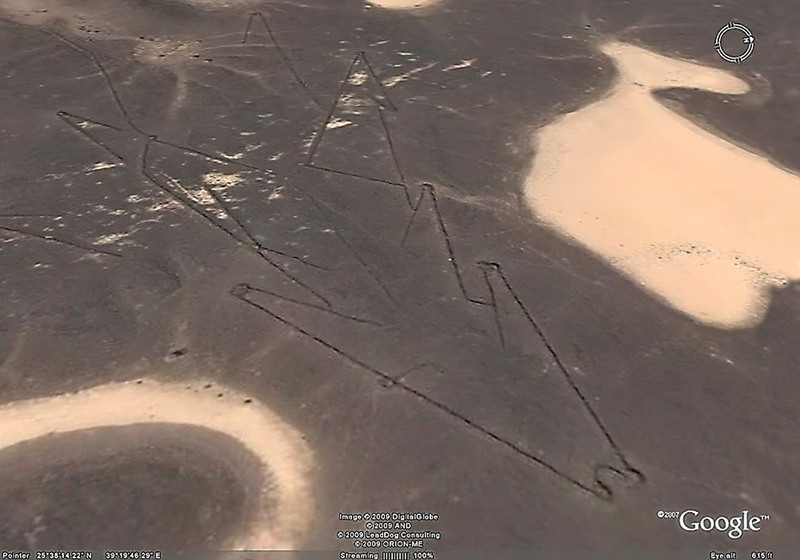 Above and below, left: In the Harrat Khaybar region of Saudi Arabia, however, “kites” take on entirely different shapes—most notably the “square pocket” and “barbed arrow”—and the low walls of many of them show ruler-straight lines, raising new questions for archeologists. 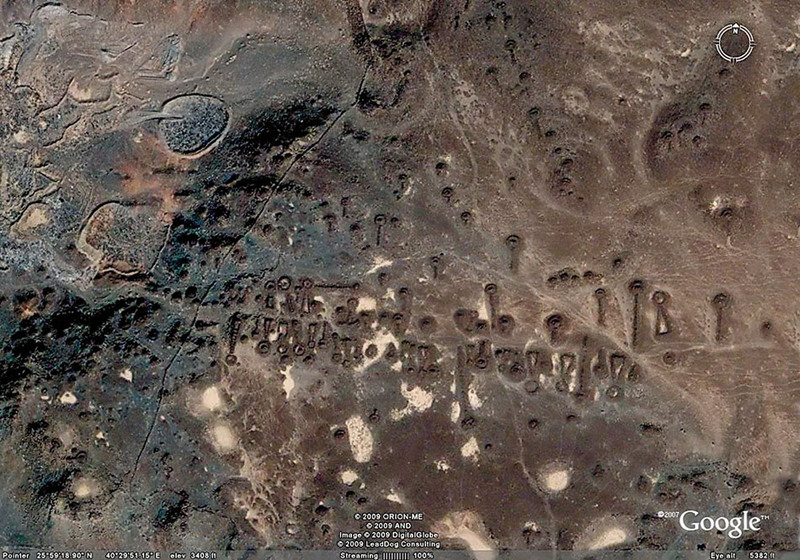 Now, some of these low walls of stone—many long known to archeologists inside Saudi Arabia—are newly visible from any computer in the world. The high-resolution image swaths reveal stunningly well-preserved evidence of widespread human activity in the distant past: www.alsahra.org, the Web site of amateur archeologist Abdullah Al-Saeed, MD, and his fariq al-sahra (“Desert Team”), is a good place to start. Another high-resolution window opens on the Harrat Harrah, which runs from north of Al-Jawf to straddle the Jordanian panhandle and reach north into Syria. 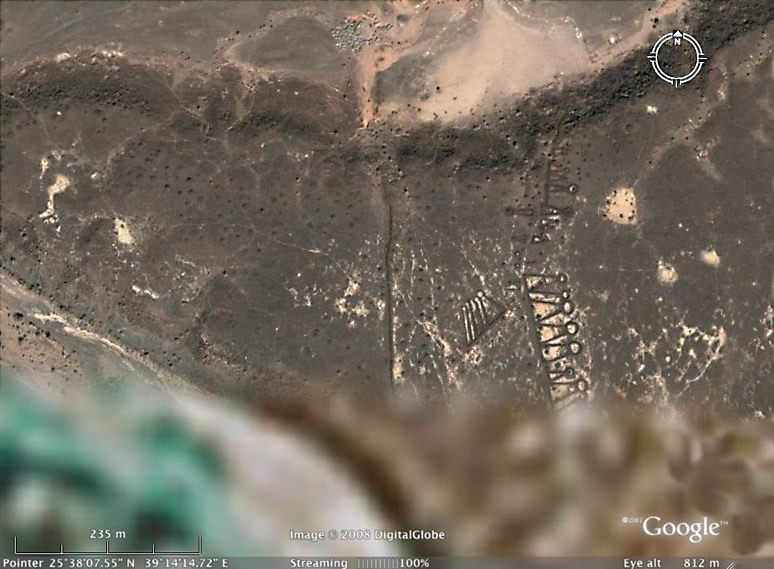 In Jordan, the Harrat Harrah has been extensively explored for decades through the Aerial Archeology in Jordan project. Its findings offer a key to at least some of what Al-Saeed and his colleagues have called attention to on their Web site and in the Harrat Khaybar. 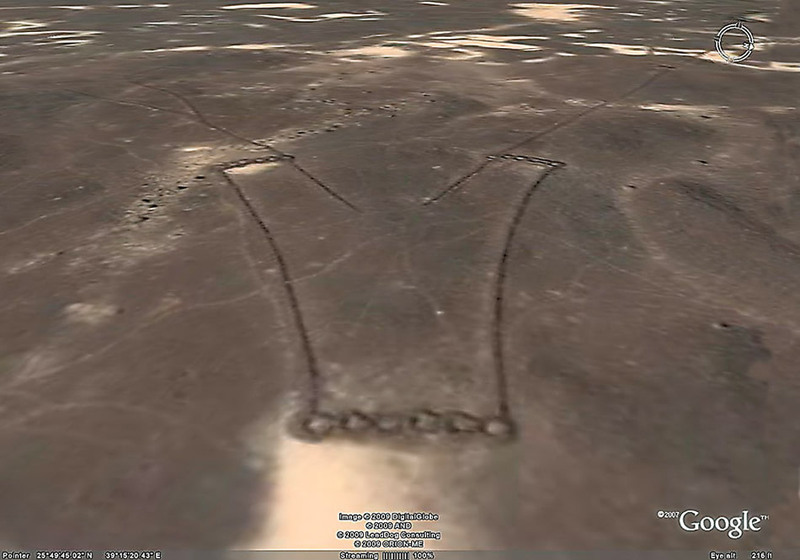 Now, Al-Saeed and his colleagues have posted on their Web site more “works of the Old Men” located 600  kilometers (372 mi) south of the Jordanian panhandle and about 200 kilometers (125 mi) north of Madinah. The most striking are the so-called “kites,” the remnants of long stone walls most likely built by groups of hunters to trap game; the walls outline the shape of a child’s kite. But the kites are huge: The “body” is a wall enclosing a corral-like space often 100 or more meters (328') across. 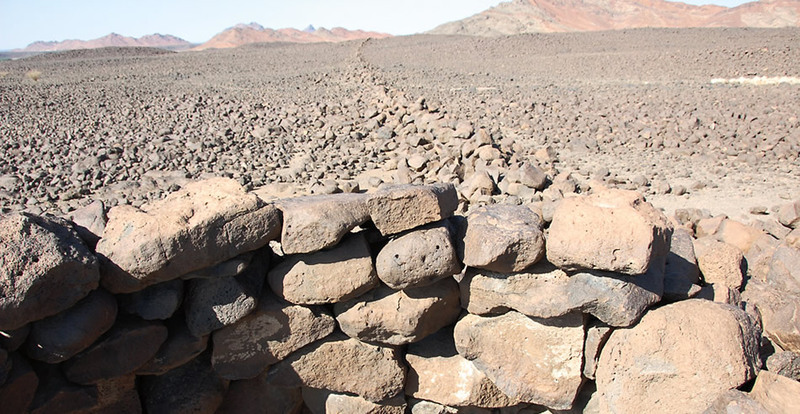 The “tails,” two or more walls running out from the head, are typically each a few hundred meters long, but they can be as long as two or three kilometers (1.2–1.8 mi). On the ground, however, kites are almost impossible to find, because the walls, built of basalt boulders, are only about a meter (3') wide and their surviving height is seldom over half a meter, making them nearly invisible on a landscape already thickly strewn with the same rock. From above, however, they stand out clearly, and their entire shape can be seen, as well as the wider patterns of neighboring kites and other structures. Hundreds of these kites—and there may ultimately be thousands—are already widely recorded as far north as Syria. Elsewhere in the world, they are known as far away as Uzbekistan and Scandinavia. In the 1920’s, raf pilots flying the Cairo–Baghdad airmail route across the Jordan panhandle thought the structures they saw looked like kites. The name stuck. Alerted by Al-Saeed, I undertook a systematic search of this Google window north of Madinah and found 239 kites in the western part of an area of 1200 square kilometers (463 sq mi). The density, about one per three square kilometers (1.16 sq mi), exceeds that in most of Jordan. As in Jordan, the Saudi kites appear in great chains running broadly north-south, the tails splaying out and sometimes linked to a neighboring kite on either side. In almost every case, the wide “mouths” represented by the kite tails open to the west or southwest—leading to speculation that this might reflect the grazing or migration patterns of the game that was hunted. The novelty of the kites in the Harrat Khaybar region, however, is that, with few exceptions, they appear in two shapes not found elsewhere: “barbed arrows” and “square pockets.” In addition, unlike the gentle, almost freehand curves that characterize the lines of most previously known kites, many of the Khaybar kites are precisely drawn, with ruler-straight lines that often meet at acute angles. 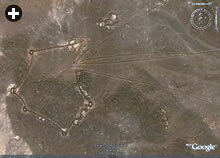 Why did the Harrat Khaybar kite builders feel the need to build such straight and angular walls? An elementary concept of precise geometric forms was clearly familiar to the designers. Indeed, it was apparently not enough for the builders to broadly define an enclosure, tails and contiguous circular enclosures—possibly hides for hunters—but it was also important to carry that through into careful design on the ground at the building stage. As these four images (above and below, right), three from the Al-Hayit region, show, keyhole and pendant shapes vary in size from a few meters to dozens of meters, and they are often found arranged along “avenues” that are invisible to builders of modern highways. Bottom right: A row of keyholes at the edge of a Google Earth high-resolution “window” in the Khaybar region is clearly discernible—but not in the bottom, low-resolution part of the image. Although this is the greatest concentration of kites in any of the newly open windows in Google Earth, there are others: Some 100 kilometers east of Harrat Khaybar, in the vicinity of Al-Hayit, Al-Saeed had found more kites. My systematic search, however, identified only 10 kites in a window of about 360 square kilometers (140 sq mi). Here, most were relatively simple. Is this disappointing? Not really—the number, variety and forms used in different regions will help answer many questions: Why were they built? When were they built? By whom? As for the purpose of the kites, the archeological consensus has long been that they were animal traps, and that the stone walls we see may have supported wooden fence posts or piles of brush. Gazelle and, to a lesser extent, oryx and onager could be driven into the widely spaced walls at the mouth of the kite and herded through the gradually narrowing space into the “head,” where more hunters awaited them for killing or capture. 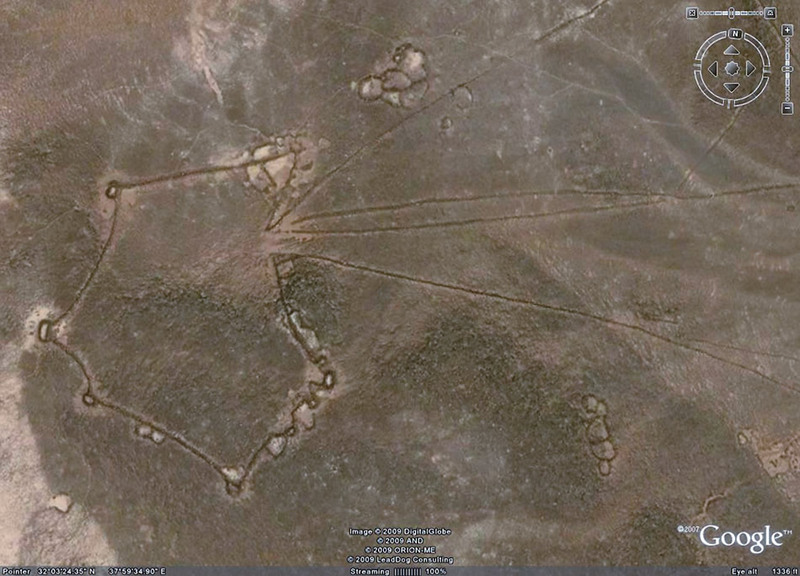 At Harrat Khaybar, it appears the builders may have used the “barbs” as sub-traps, or traps-within-the-trap. Although there have been dissenting scholars arguing for the use of kites as enclosures for livestock husbandry, that explanation is not convincing to most. Nonetheless, there are no definitive answers, only hypotheses. Two other structures known in Jordan were also found again in the new Saudi Arabian windows. First are the “wheels” that have been encountered widely; in Jordan, they are often located close to kites. They come in a variety of forms, most simply a near-perfect circle of 20 to 50 meters’ (65–165') diameter in which six or more spokes create wedge-shaped chambers around a central hub. Others have a succession of small cairns running round the outside of the rim. 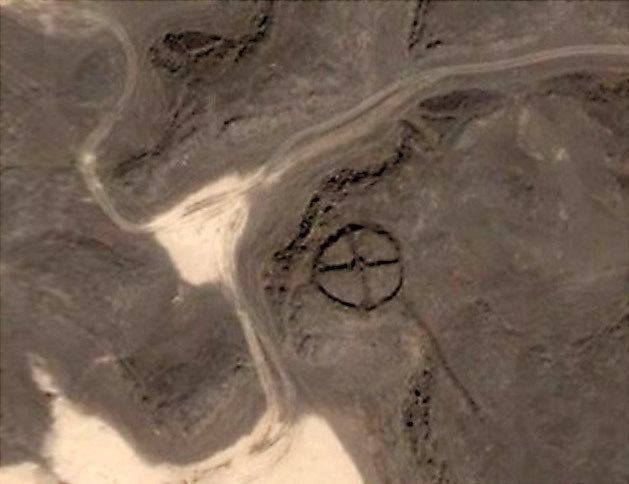 In the windows visible over Saudi Arabia, these wheels are rare; they are usually smaller than the Jordanian ones, and they often consist of just four spokes. Their purpose may be funerary, but that is no more than a conjecture. Viewed from the ground, rough walls of piled stones outline a “keyhole” tomb. Second, and more abundantly, are two types of what also appear to be burial structures, which collectively must represent sustained activity over a long period of time. First there are “pendant tombs”—circular burial enclosures at the end of a line of small cairns. These have turned up in both the Harrat Khaybar and Al-Hayit areas. In a few instances, they have a second enclosure at the other end (“double pendant tombs”). They often turn up in large groups, forming what appear to be entire cemeteries, or parts of them, and they are to be counted in the hundreds, perhaps even in the thousands. Now we come to the “keyhole tombs” and the “gates,” both novelties of the Harrat Khaybar, structures that are striking because of their unexpected, unique forms and their astonishing numbers. The keyhole tombs usually consist of a circular enclosure at the head of stone walls that form an isosceles triangle. There are numerous variations in size and in the relationships of circles and courtyards: In a few places the two are completely separated, and in others the triangle has been elongated so much it begins to look similar to the general form of some pendant tombs. 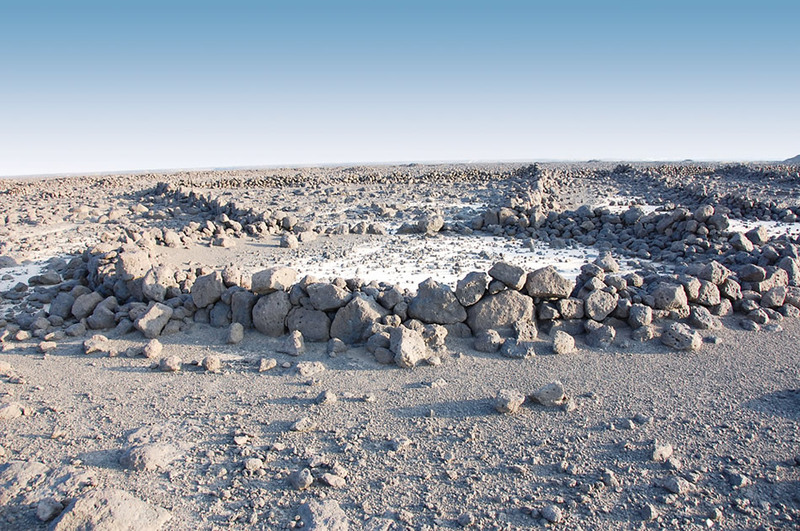 Al-Saeed and the Desert Team visited a number of these structures, and their ground photographs confirm that the walls are built of dry-laid masonry, but set out carefully and often still standing a meter or more high. I have yet to count the various tombs in the Khaybar and Al-Hayit areas, but they appear to number well into the thousands. 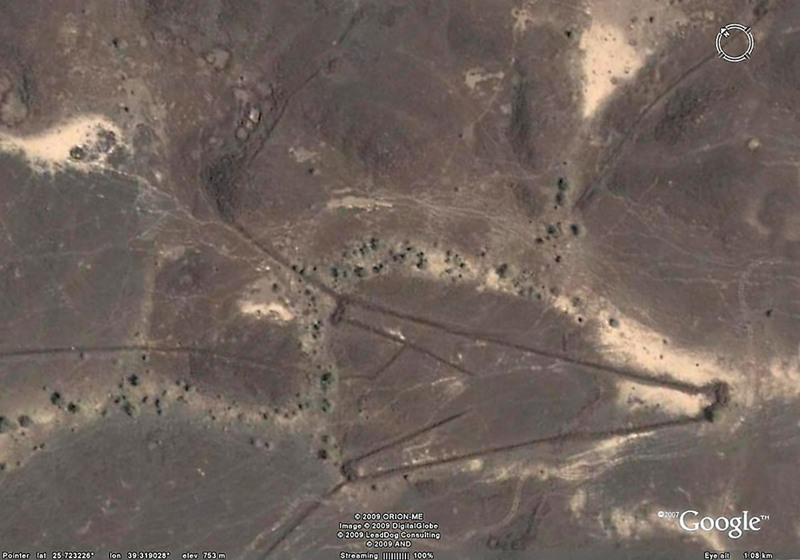 In some places they form necropolises, with the tombs arranged on either side of avenues: Around Al-Hayit, I counted 13 such avenues with an aggregate length of about 24 kilometers (15 mi). Extrapolating from a count of a randomly selected section, I estimate there are about 1000 tombs on these avenues. To that we should add as many more tombs scattered in between, plus an unknown number already overbuilt by modern development. 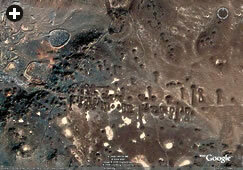 All around these are even larger numbers of small circular tumuli, which may be the remains of individual burials. In all, we are looking at one of the most extraordinary prehistoric funerary landscapes on the planet—and that’s still not all. 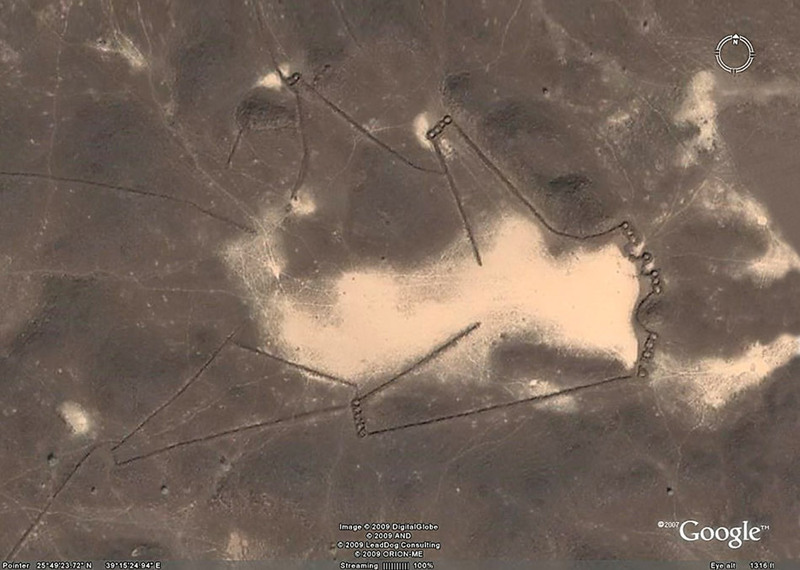 Also visible in the Harrat Khaybar window, mainly in the same area as kites but also further east, are hundreds of sites which can best be described as looking like simple gates laid flat: a “post” at either end with two (but occasionally three to five) “rails” in between. They can vary a great deal in size, from five or 10 meters long (16–32') to a hundred meters (320') or more. The key element is surely the posts, which appear to be dense heaps of boulders, and which may again be burial places. My own count yielded 95 such gates, but only a future detailed survey, including ground visits, will fully catalogue them. Top: This rare “wheel” structure in Saudi Arabia is simpler than the more numerous “wheels” in Jordan (above). 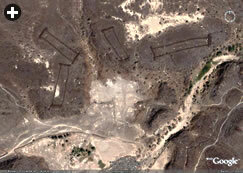 Above and below: Called “gates” by archeologists, these rectangular shapes appear to be unique to Saudi Arabia, and their purpose remains obscure. As to who built them and when, Jordanian fieldwork has concluded that kites and at least some of the associated structures date back to around the fifth millennium BC, to a time characterized by a wetter, lusher environment with far more vegetation, perennial water and the kind of abundant wildlife so richly depicted in the rock art. Whether that is also true, even broadly, of the Khaybar kites is too soon to tell, for their more sophisticated forms and rather sharper appearance may imply less decay and thus a younger age. 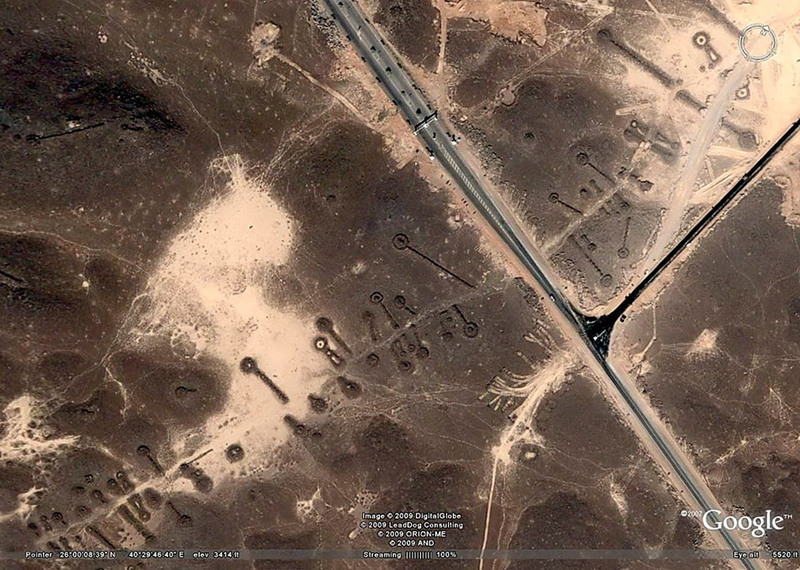 As for the cemeteries, many of the keyhole and gate types are entirely new forms, but the pendants have parallels in Jordan, where a recent discovery of a necropolis from between the late Neolithic and the early Bronze ages, with hundreds of tombs and ritual structures dating back an estimated 9000 years, includes pendant tombs like those in Saudi Arabia. Already these isolated areas of publicly available high-resolution satellite imagery have expanded our knowledge and understanding of ancient human activity in the west-central Arabian Peninsula. 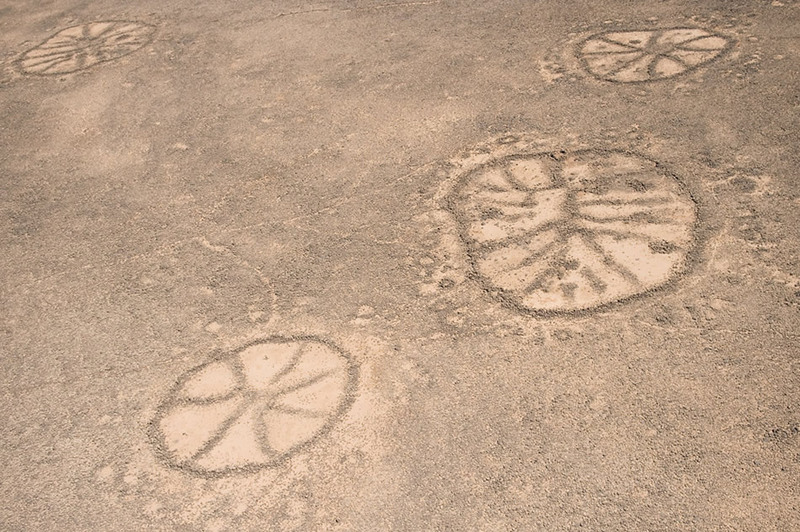 Alongside the astonishing thousands of rock art records further north (and worth searching for near the new kites, too, since kites and rock art are often found together in Jordan), the archeology, and indeed the cultural heritage, of Saudi Arabia continues to emerge as both astonishing and impressive. As Google Earth gradually pieces in further high-resolution imagery, this “archeological explosion” will create immense opportunities for studying—and challenges for surveying, presenting and preserving—the sites in Saudi Arabia and, for that matter, all around our ever more visible world. David L. Kennedy (dkennedy@cyllene.uwa.edu.au) is Winthrop Professor of Ancient History and Roman Archeology at the University of Western Australia. He has taken part in aerial archeology in the Middle East for some 25 years. Abdullah Al-Saeed, MD (drbinsaeed@gmail.com) is a Riyadh-based neurologist and the founder of the Desert Team, an informal group whose members are passionate about the geography, history and culture of Saudi Arabia. This article appeared on pages 2-9 of the July/August 2009 print edition of Saudi Aramco World.